Bobby Fong finished second in the season-opener at Michelin Raceway Road Atlanta in the Supersport class. Team Hammer came out swinging as the 2019 MotoAmerica AMA/FIM North American Road Racing season got underway on Saturday at Road Atlanta. The new-look Team M4 ECSTAR Suzuki Supersport duo of Bobby Fong and Sean Dylan Kelly continued to show enormous potential as a pairing, backing up a double podium performance in last month’s Daytona 200 with another 2-3 result in Saturday’s MotoAmerica Supersport season opener. At Daytona, it was young gun Kelly who claimed pole position and finished as the race’s runner-up. Today in Atlanta, it was Fong who took those honors. 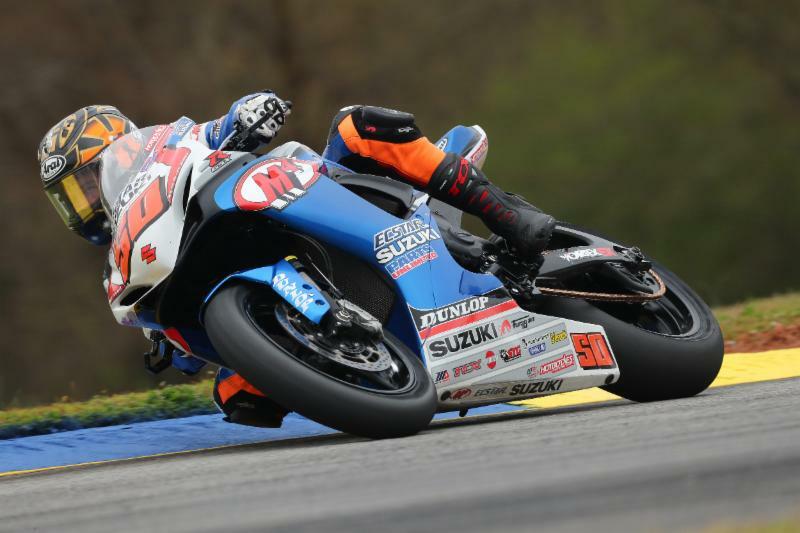 The 28-year-old multi-time MotoAmerica race winner has demonstrated tremendous speed aboard his Team M4 ECSTAR Suzuki GSX-R600 all weekend long. He secured pole position by more than six tenths of a second, threw down the fastest lap of Race 1, and twice threatened to break away at the front. Only a frenetic race in which Fong clipped a cone, lost his front fender, and ran wide while battling for the lead on more than one occasion could prevent him from climbing to top step of the podium. 16-year-old Kelly, meanwhile, continued to make big leaps forward with each additional session aboard his Supersport-spec GSX-R600. He earned himself a spot on the outside of Row 2 in qualifying and proceeded to clip nearly a full second off his qualifying best during Race 1. That additional speed allowed Kelly to fight as part of a four-rider pack contesting third position. He ultimately won that battle at the checkered flag, kicking off his MotoAmerica career with a podium performance. “What a way to start,” Kelly said. “I’m super happy with this podium. This is how we wanted to start. I don’t know if I was expecting the podium, especially after starting from sixth. But my bike was really good and we worked super hard. Yesterday was my first time here, so we’re still learning the track. Team M4 ECSTAR Suzuki’s Superbike ace, Jake Lewis, did well to salvage a strong result after dealing with drama of his own. The Kentuckian qualified on the second row in Superpole, but was forced to start from dead last after missing the citing lap due to an electrical problem. The issue forced Lewis to slowly roll off the line at the start — spotting the field several seconds — before he even reached the season’s first turn. However, Lewis put his head down and charged forward throughout the race aboard his Team M4 ECSTAR GSX-R1000 Superbike. In the end, he made his way up to seventh at the checkered flag with sixth place firmly in his sights. The Team Hammer Twins Cup contingent also enjoyed a promising debut. Reigning Junior Cup champ Alex Dumas hinted at his vast potential aboard the Roadracing World Young Guns Suzuki SV650 with a hard-earned fifth position. Meanwhile, Joseph Blasius notched up a top ten of his own, piloting the Autovest Suzuki SV650 to tenth after topping a practice session and clocking the third best time during the class’ opening qualifying session. Team Hammer will look to add to its season-opening trophy haul as the MotoAmerica Road Atlanta concludes on Sunday.